Opening remarks at the national open lesson Russia Focused on the Future. Today’s event is called an Open Lesson. This lesson implies following a particular method and pursuing particular objectives. Today’s event cannot be called a lesson in the traditional sense, and I will therefore not attempt to stick to a particular logic in my words. National open lesson Russia Focused on the Future. This event is taking place on the Day of Knowledge, the start of the new school year. I therefore want to congratulate on this wonderful occasion, the Day of Knowledge, everyone here today and all the students, schoolchildren and teachers watching us via various media channels. Let us not forget your parents either, especially the parents of children who are just starting school this year and taking their first steps on the road to knowledge. I congratulate them too. We opened 79 new schools in time for the new school year this year, two of which, I think, are here in the Yaroslavl Region. I thank Acting Governor Dmitry Mironov for keeping his promise to the people and seeing the project’s completion by the end of the year. A total 170 schools will open by the end of the year, and this is the authorities’ contribution – and not their sole contribution – to developing education. But I want to begin with something else. We watched the video just now and saw what our country has achieved over these last years. 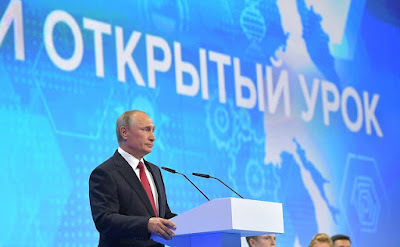 I flatter myself with the thought that I could have shared some interesting news and information on our recent history, the principles underpinning our economic and social development today, and international relations with those present here or watching on screen and at your computers. These issues are all the subject of special meetings and work. 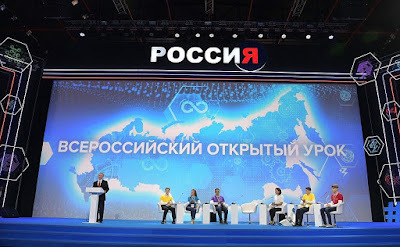 Vladimir Putin attended the National open lesson Russia Focused on the Future. But today is not the time and place for this. As I said, today is a holiday. Nonetheless, taking the video we just watched on our country’s achievements as a departure point, I want to say that it demonstrated our latest advances in different areas. I was speaking with Governor Mironov on the way here before, and he said, “Look, there’s the Assumption Cathedral, built in honor of Yaroslavl’s 1000th anniversary”. Yaroslavl alone is more than 1,000 years old, and our country has been in existence for far longer than this. Why am I saying this? If you look around, you realize that not all countries and peoples have withstood this test of time, have lived, developed, overcome difficulties and grown stronger for more than 1,000 years. Over this 1,000 years, our ancestors, the generations that went before us have made tremendous efforts to make our country the strong and powerful state that it is today. They crossed it all the way to the Pacific Ocean and attained great achievements in science, technology and education. All future generations, and this is a cliché you have heard many times, always surpass the previous ones, and achieve more. This is true. This is only natural, because new generations build on the foundation created by their predecessors. Knowledge has become wider and deeper; technology has become more sophisticated and exciting, creating opportunities to take another step forward. However, your goal is not just to do something new. That goes without saying. It will, indeed, be something new based on what was created earlier. Your goal is to take a new step forward. This is true, this is how things are, indeed. But look at how the world is developing. There are countries which are incomparably larger than our country in terms of population. There are countries where technology and modern administrative tools are much more effective than ours. Hence, the question: if we have existed for over 1,000 years now, and are actively developing and growing stronger, that means that we have something that is helping us do so. This something is our internal ”nuclear reactor,“ which propels us. This passion with which Gumilev spoke about in his own time, keeps pushing our country forward. President Putin during the National open lesson Russia Focused on the Future. You, who are now entering active life, need to bear this in mind, be aware of it and not just do better than previous generations, but do better on a new level, and not only in comparison with what was done in our country, but in comparison with our competitors all over the world. I am not talking about enemies of every stripe. Now is not the time to talk about sad things. I am referring to competitors, and the competition is always strong. We have another overused phrase about how we did no worse than someone else. We should always do better precisely because of the circumstances that I just mentioned. There are countries with larger populations and with more advanced technology and administrative tools. For us to be able to maintain our sovereignty, and to make the lives of our people and future generations, your children and grandchildren, better than today, it is imperative to make qualitatively new advances. That is why the step you are taking today – choosing your profession and your path in life – is so important for you. You saw them on the screen. I will not go over them again. They are very exciting, modern, and promising. They include space exploration, innovative energy sources, transport, biology, and cognitive science. They are about the synergy of various areas of knowledge and technology that produce the maximum effect, nature-like technologies, and so on. Medicine and education, too, by the way. You have to choose your own path. You will repeatedly – practically all your life – be faced with a problem of choice. A person always makes a choice if he feels he wants to live and do, to derive satisfaction and pleasure from life and offer up the results of his labor to the altar of the Fatherland and share them with other people. In fact, this is generally the highest satisfaction you can derive from your work. I hope very much that you will be able to make this choice without delay. The earlier you make it the better, the more time you will have to make improvements, polish up something, consult somebody and make adjustments. As a rule, life today requires narrow specialization and to achieve this it is necessary to think this over and get to the bottom of the problem that you would like to devote your lives to solving. I would like to sincerely wish you success. I would like to wish success to your teachers. 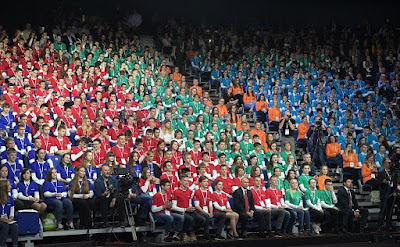 I am very pleased that such a unique event, without exaggeration, as the choice of an occupation by senior-level students is being held in Yaroslavl for the fifth time. Naturally, our major companies should be involved in this by all means. I was very pleased to note that many people whom I have known for a long time and appreciate are today here in Yaroslavl. They are taking part in this joint work; the first contracts are being signed, in this case with students who also took part in this event in Yaroslavl. I would like to wish success to all of you. I am hoping that in the near future we will see what you produce and that you will be content with how you live and what you do and be proud of your achievements. To see where we need to go and how we should develop, the Ministry of Education organizes an essay project every year. 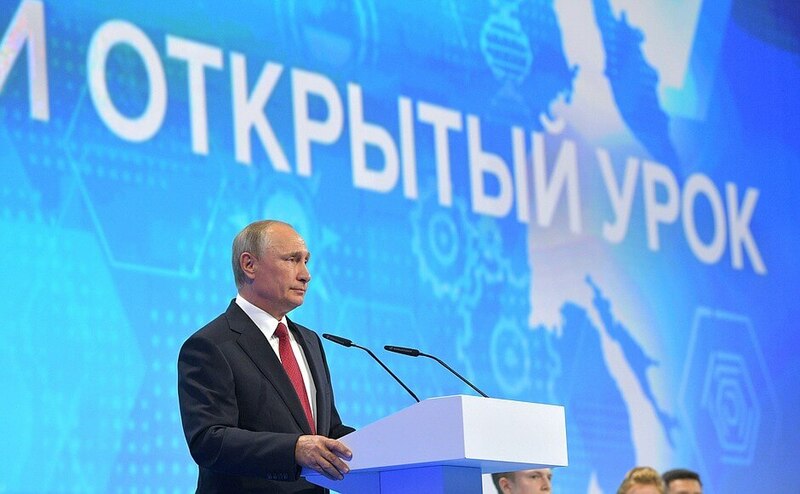 I suggest writing essays on the theme “Russia Focused on the Future!” to see what you think our country will be like on the threshold of the 2040s and 2050s. 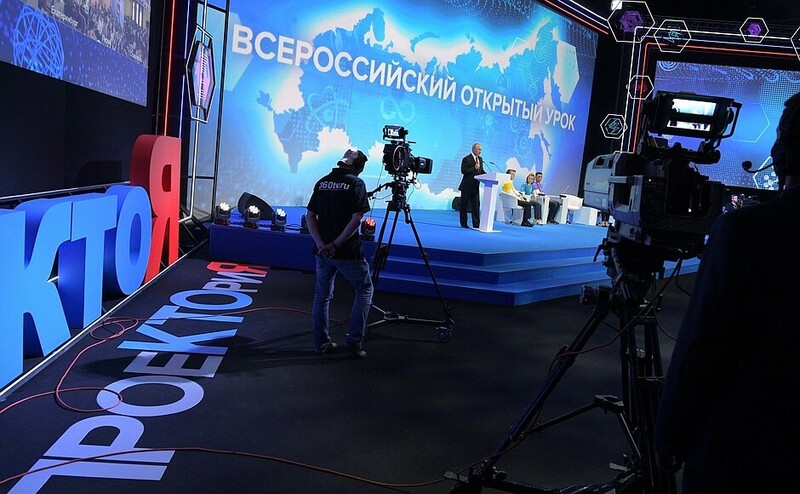 0 Comment to "Putin attended the National open lesson Russia Focused on the Future"